Sharpen your circuit-building skills by finding out how to read the colorful stripes on resistors and how to make your own jumper wires. Then take a look at how batteries work so you’re sure to get the most out of these common energy sources. If you think those colorful bands on your resistors are there just for show, think again! Those bands tell you the value of the resistor. Before you can decode the resistor value, you need to know a little more about resistors. For instance, you may buy what you think is a 100 Omega resistor, but the actual resistance most likely isn’t exactly 100 Omega. It may be 97 or 104 Omega, or some other value close to 100 Omega. For most circuits, “close” is good enough. Precision resistors, which have more precise values than standard resistors, have five color bands. Four of the bands tell you the nominal value. The fifth band tells you the tolerance. You can count on the actual resistance of a precision resistor being really close to its nominal value. So, if you buy a 100 Omega precision resistor, chances are its actual value is within 1 or 2 of 100 Omega. The following figure shows a diagram of the color code of a standard (four-band) resistor. 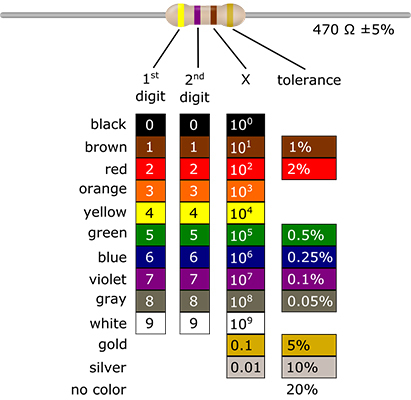 You use this color code to figure out the nominal value and tolerance of a standard resistor. Decide which band is the first band. Compare the ends of the resistor. Usually, the colored band at one end is closer to that end than is the colored band at the other end. If that is the case, the band that is closest to one end of the resistor is the first band. If you can’t determine which is the first band, look at the two outer bands. If one of the outer bands is silver or gold, that band is probably the last band, so the first band is at the other end. Look up the color of the first band in the column labeled “1st digit” and find the number associated with that color. This number is the first digit of the resistance. In the resistor shown in the preceding figure, the first band is yellow, so the first digit is 4. Look up the color of the second band in the column labeled “2nd digit” and find the number associated with that color. This number is the second digit of the resistance. In the resistor shown in the preceding figure, the second band is violet, so the second digit is 7. Look up the color of the third band in the column labeled “X” and find the number associated with that color. This number is the multiplier. In the resistor shown in the preceding figure, the third band is brown, so the multiplier is 101 (which is 10). Put the first two digits side-by-side to form a two-digit number. For the resistor shown in the preceding figure, the first two digits are 4 and 7, so the two-digit number is 47. Multiply the two-digit number by the multiplier. If you have a precision (five-band) resistor (which you’re unlikely to use for projects in Electronics For Kids For Dummies), the third band gives you the third digit of the resistance and the fourth band gives you the multiplier. To figure out how far off from the nominal value the actual resistance could be, you look at the fourth band on a standard resistor (or the fifth band on a precision resistor). Refer to the preceding figure for the color code for the tolerance of a resistor. Say that the fourth band of the 470 Omega resistor you have chosen for a particular project is gold. The color, gold, in the column labeled “tolerance” in the figure represents a tolerance of 5 percent. Because 5 percent of 470 is 23.5, the actual resistance could be as much as 23.5 Omega higher or lower than 470 Omega. So the actual value of the resistance could be any value from 446.5 to 493.5 Ω. Most standard resistors have tolerances of 5%, 10%, or 20%, and most precision resistors have tolerances of 1% or 2%. For the majority of circuits — and in all the projects in Electronics For Kids For Dummies — it’s okay to use a standard resistor. For certain circuits, it’s important to use a precision resistor with a lower tolerance. The following figure shows you two more examples of resistors and their values. You can measure the actual value of a specific resistor using a device called a multimeter. For example, when you use a multimeter to measure a 470 Omega resistor with a 5 percent tolerance, you might found that the actual value is 481 Omega. A jumper wire is a short insulated wire with bare (stripped of insulation) ends. 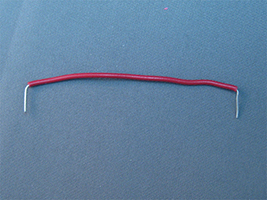 You use jumper wires, such as the one shown in the following figure, to connect two points in a breadboard circuit. Even if you have a set of precut jumper wires, chances are you’ll need to make a jumper wire of a specific length for a circuit or two. Making a jumper wire isn’t that hard, as long as you have the right wire, tools, and a little patience. You start with a reel (or long piece) of insulated wire that is thick enough — but not too thick — to fit into the contact holes of your breadboard. The gauge (pronounced “gage”) of a wire is a measure of its diameter. Look for 20- or 22-gauge wire. In North America, the gauge is often labeled AWG (for American wire gauge). You also need a wire cutter and a wire stripper, or one tool that does both jobs, as well as needle-nose pliers. You’ll find it much easier to make jumper wires if your wire stripper has a gauge-selection dial or several cutting notches labeled for various gauges. Gauged devices allow you to strip insulation without worrying about cutting the wire underneath the insulation. If you use a generic wire stripper, you have to be very careful not to nick (accidentally cut into) the wire when you’re stripping off the insulation. Nicks weaken the wire, and a weak wire can get stuck inside a breadboard hole and ruin your whole day. 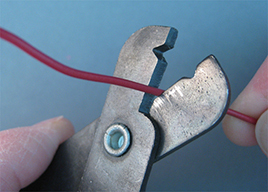 Cut the wire to the length you need, using a wire-cutting tool. If you need, say, a 1-inch jumper wire, cut a length of wire that is at least 1-3/4 inches long, so you leave room to strip some insulation off each end. It’s better to cut a longer length of wire and trim it down if you need to than to cut a shorter length of wire and find that it’s too short for your circuit. Strip off about 1/4- to 1/3-inch of insulation from each end. Dial the gauge to 20 or 22 (depending on what gauge your wire is) or locate the notch that is labeled 20 or 22. With the jaws of the wire stripper open, place the wire in the appropriate notch of the wire stripper, so that roughly ¼- to 1/3-inch of the wire extends past the wire stripper. Firmly grip the wire stripper — as if you’re trying to cut through the wire — while twisting and pulling the wire through the stripping tool. The insulation should come off but the wire should remain intact. 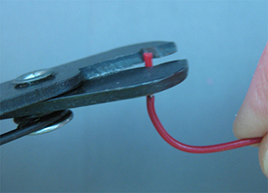 Place the end of the wire into the cutting blades of the wire stripper, so that roughly 1/4- to 1/3-inch of the wire extends past the wire stripper. Release your grip on the wire stripper, rotate the wire a quarter turn, and then grip the wire stripper again with just enough pressure to begin cutting through the insulation. Rotate and repeat steps b and c two or three more times, until you have nicked the insulation all the way around the wire. Grip the wire stripper — but not too tightly — around the nicked insulation while pulling on the other end of the wire to force the insulation off. Bend the exposed ends of wire at a right (90-degree) angle. Use your needle-nose pliers to do this. 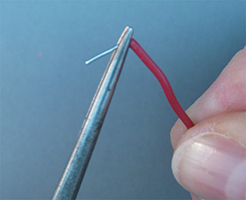 With a little practice, you’ll become an expert in making jumper wires! Have you ever mixed vinegar with baking soda to create a volcano for a science fair project? The bubbling that you see is the result of a chemical reaction. This reaction is very similar to how batteries work. The reaction, however, occurs inside a battery, hidden from view by the battery case. This reaction is what creates the electrical energy that the battery supplies to circuits. A typical battery, such as a AA or C battery has a case or container. Molded to the inside of the case is a cathode mix, which is ground manganese dioxide and conductors carrying a naturally-occurring electrical charge. A separator comes next. This paper keeps the cathode from coming into contact with the anode, which carries the negative charge. The anode and the electrolyte (potassium hydroxide) are inside each battery. A pin, typically made of brass, forms the negative current collector and is in the center of the battery case. Each battery has a cell that contains three components: two electrodes and an electrolyte between them. The electrolyte is a potassium hydroxide solution in water. The electrolyte is the medium for the movement of ions within the cell and carries the iconic current inside the battery. 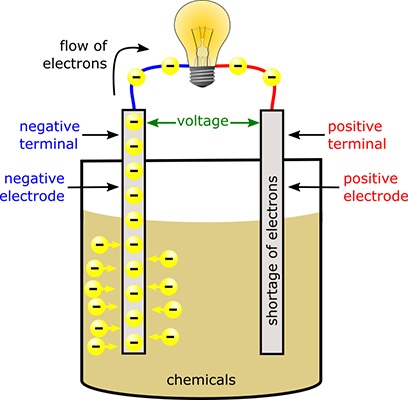 The positive and negative terminals of a battery are connected to two different types of metal plates, known as electrodes, which are immersed in chemicals inside the battery. The chemicals react with the metals, causing excess electrons to build up on the negative electrode (the metal plate connected to the negative battery terminal) and producing a shortage of electrons on the positive electrode (the metal plate connected to the positive battery terminal). The difference in the number of electrons between the positive and negative terminals creates the force known as voltage. This force wants to even out the teams, so to speak, by pushing the excess electrons from the negative electrode to the positive electrode. But the chemicals inside the battery act like a roadblock and prevent the electrons from traveling between the electrodes. If there’s an alternate path that allows the electrons to travel freely from the negative electrode to the positive electrode, the force (voltage) will succeed in pushing the electrons along that path. When you connect a battery to a circuit, you provide that alternate path for the electrons to follow. So the excess electrons flow out of the battery via the negative terminal, through the circuit, and back into the battery via the positive terminal. That flow of electrons is the electric current that delivers energy to your circuit. When the electrodes are connected via a circuit, for example, the terminals inside a flashlight or those in your vehicle, the chemicals in the electrolyte start reacting. As electrons flow through a circuit, the chemicals inside the battery continue to react with the metals, excess electrons keep building up on the negative electrode, and electrons keep flowing to try to even things up — as long as there’s a complete path for the current. If you keep the battery connected in a circuit for a long time, eventually all the chemicals inside the battery are used up and the battery dies (it no longer supplies electrical energy). The electrolyte oxides the anode’s powered zinc. The cathode’s manganese dioxide/carbon mix reacts with the oxidized zinc to produce electricity. Interaction between the zinc and the electrolyte produces gradually slow the cell’s action and lowers its voltage. The collector is a brass pin in the middle of the cell that conducts electricity to the outside circuit. Note that the two electrodes in every battery are made from two different materials, both of which must be electrical conductors. One of the materials gives electrons and the other receives them, which makes the current flow.